Famous for the eponymous cheese, Beaufort is one of the best bases for fabulous climbs in the north French Alps. This quaint little town surrounded by mountains is on the Route des Grandes Alpes and provides incredible challenges on quiet stunning roads in all directions. This is cycling country and just off the main square is a HUGE map of all the various cycling routes in the area. The tourist office provides fantastic route cards (example on left) for more than a dozen rides ranging from family friendly down low to giant alpine loops for the super strong. 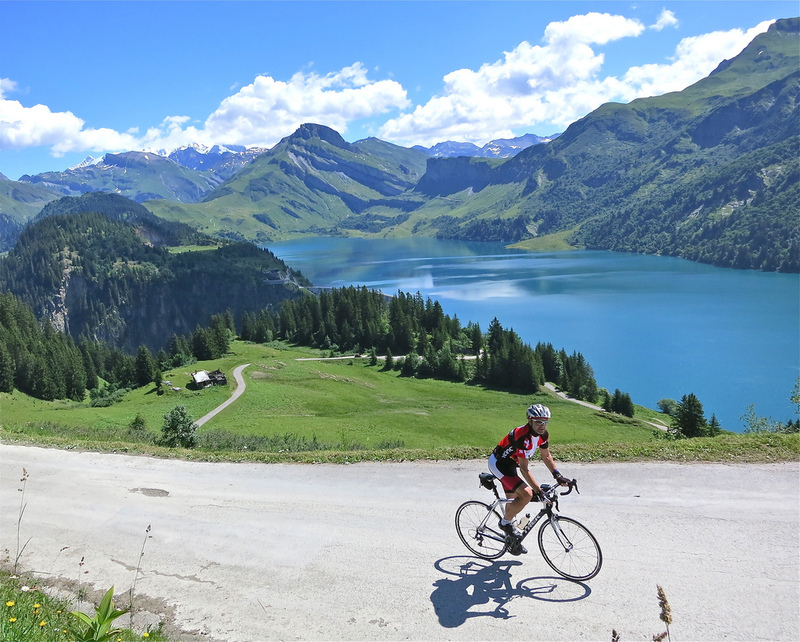 Of note, probably the best known climb in the area – Col des Saisies – doesn’t make my top 5 (click here for info on Saisies). Here are my top 5 climbs from Beaufort. At the bottom of the page is an interactive map of all 5 routes. 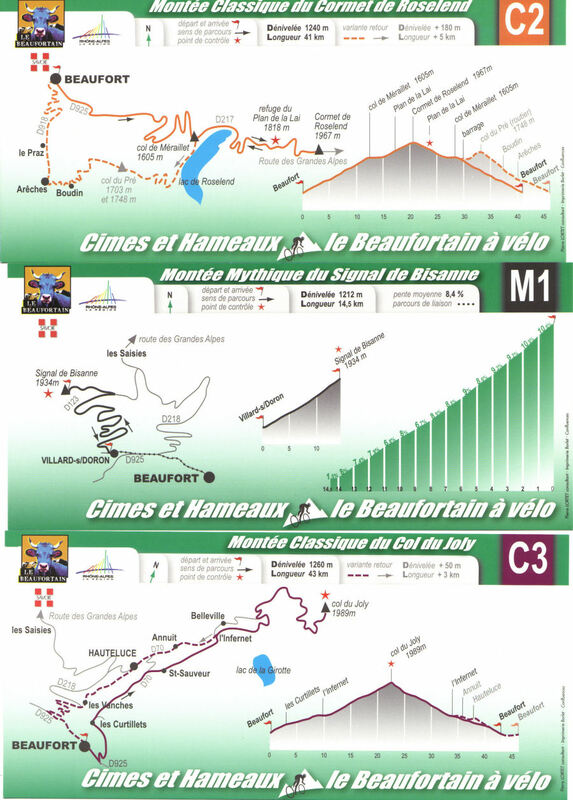 This is in large part a summer “To-Do” list for me as I have only climbed the first 2 of these 5 climbs all 5. 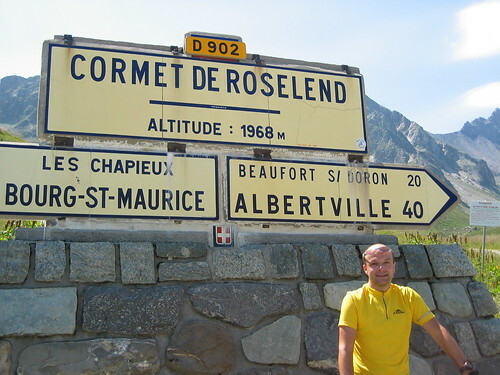 Cormet de Roselend has been in the Tour de France 9 times, most recently in 2007 when Rasmussen was the first over the top. Part way up at the Col du Meraillet is a huge lake created by a dam creating a superb environment. This is one of two climbs that the tourist office calls “mythic.” This is a much steeper alternate route up Cormet de Roselend. The Col is above the alpine lake – see photo for the stunning view. Descending the Col you can cycle right over the dam and join the Roselend route at the Col du Meraillet. Of course the stats are even bigger if you do include Roselend. I really want to climb this route. 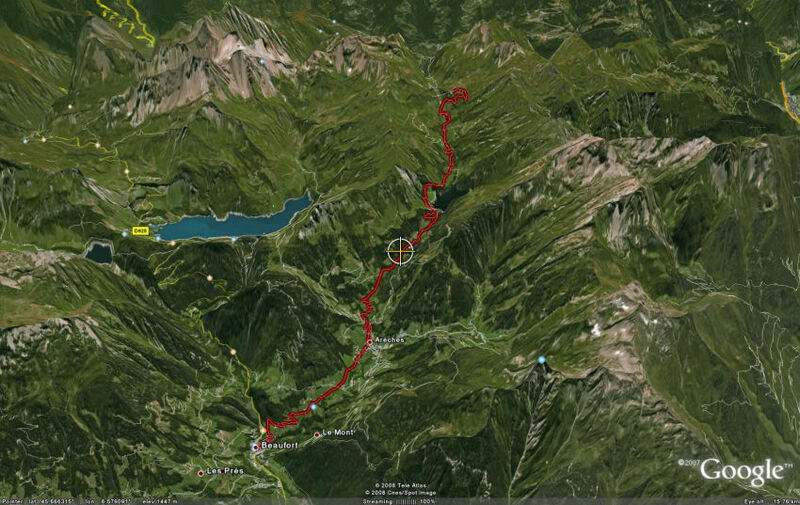 Note, the last three kilometres require a mountain bike – but you can join a path on the other side and descend all the way to Bourg St Maurice – returning via the south side of Cormet de Roselend would make a pretty epic route. A long steady climb through a quiet valley to high summit. Apparently there is very good hiking from the Col. This is the other “mythic” climb. 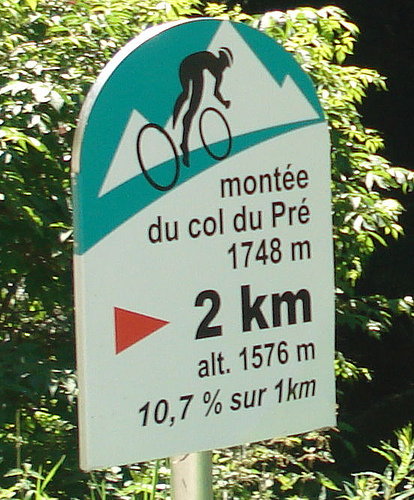 It shares the same mountain as Col des Saisies but goes much higher and is much steeper. A monster. Click “View Larger Map” at bottom for a clearer view of climbs. That is a man talking. Just crashed his complete front and mainframe, but nothing will stop him from planning for more. I’m in for these cols Will! For me the more beautiful area in the Alps with great climbs. Normally, I have to go there in June with my bike. PS: For the difficulty, Signal de Bisanne must be done by Albertville. oui – tu as raison – mais depuis Albertville jusqu’au depart il ya un peu de trafique. Yes, you are correct – but from Albertville to the “start” of Bisanne there is a bit of traffic and for me it’s not that steep or interesting. 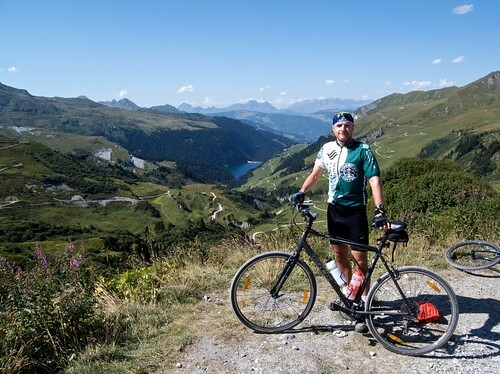 I was thinking that Cormet d’Areches is the perfect sort of route for you with your touring bikes and sense of adventure – over to Bourg St Maurice. Yes… and I’ll have wine with that climb please. Just curious how do you say Beaufort? There are two here in the states… one in North Carolina and one in South Carolina. In NC, it’s pronounced “boh-fert” and in SC it’s pronounced “byoo-fert”… what’s the Swiss way? Actually, the Cormet d’Arèches is probably very interesting. -Les Saisies: you can climb towards the Montagne de Vorès (north). At the beginning the road is paved with one col ( about 1780m) then the road becomes a path but very feasible with 3 cols. 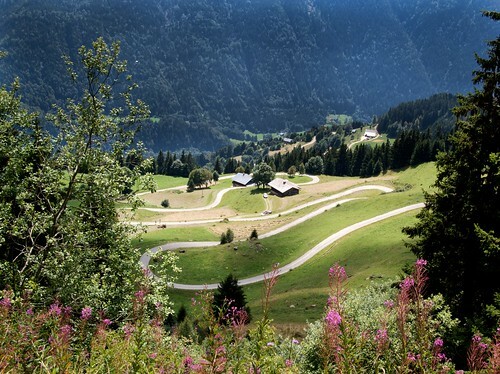 After it’s possible to join the road of Col du Joly (La planay). If I go there I think I’ll try. I can Imagine above Col du Pré is beautiful. The Alpine lake below is huge. 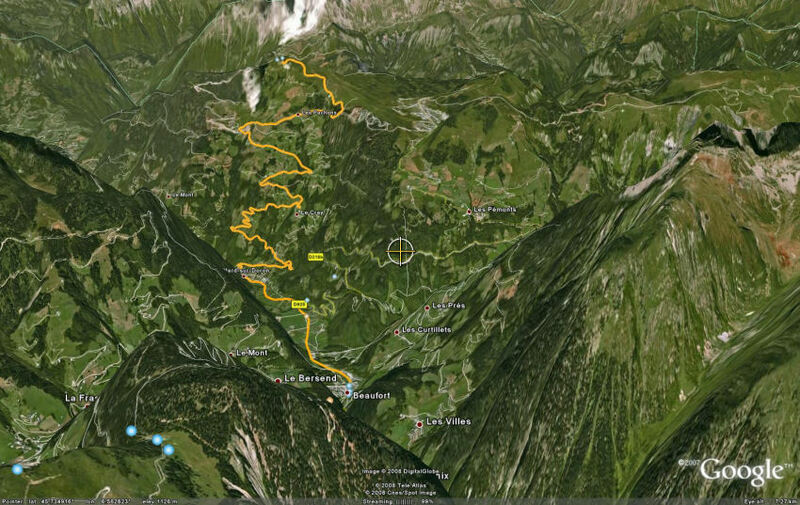 Cormet d’Areches is the one I really want to try – the mountains are much higher and savage than near Saisies / Bisanne. i linked onto your site from mimbo’s forum. i think you made awesome modifications. beautifully done!!!!! Fantastic website- browsing through it has effectively prevented me from doing any work this afternoon. My partner and I (47 and 50 y.o. – enthusiastic but slow uphill, recreational cyclists from Australia) are planning a trip to France this August. We are taking our bikes (compact cranks- 34/29 low gear) and will be spending a week cruising on the Canal du Midi, using the canal boat as a base for rides, and then a week in friends’s chalet near Courchevel in mid September. 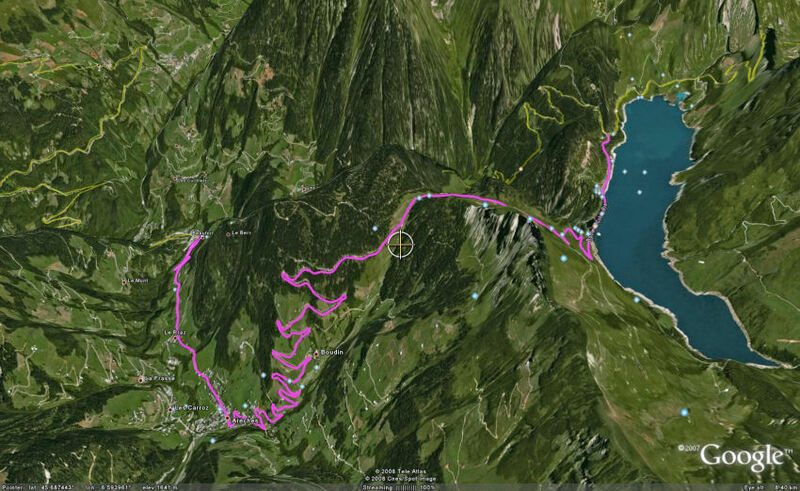 We “enjoy” slogging uphill, and, of course, flying downhill, and I was musing that I would like try the eastern side of the Cormet de Roseland and perhaps the northern side of the Madeleine (on different days, of course), both of which seem be within reach. 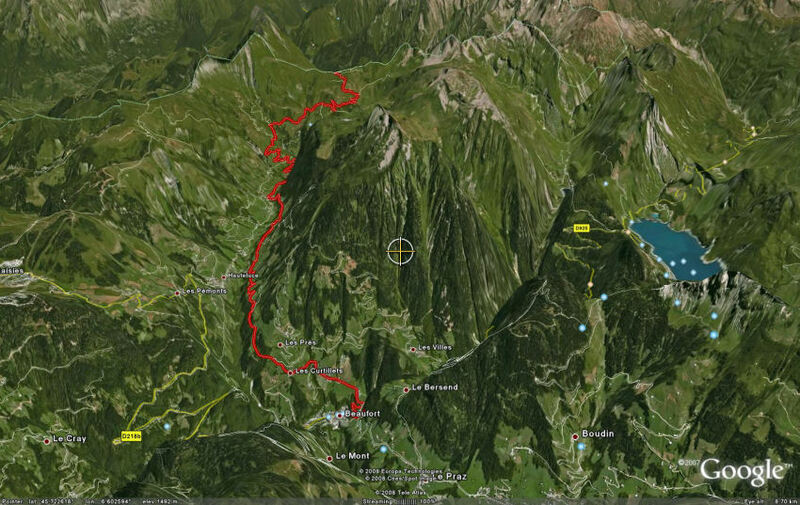 Do you think that either or both these climbs would be feasible? Any other suggestions? Of course they are feasible 😉 – you have the right gearing, just take your time and enjoy. Both Madeleine and Roselend are very nice climbs. 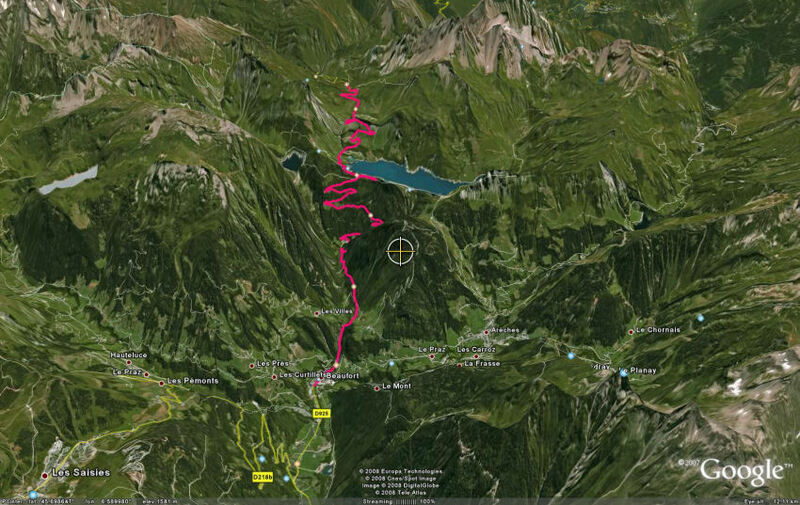 If you are staying in Courchevel, there are lots of interesting rides up to ski stations nearby – many which I haven’t yet explored. Val Thorens might be the best (two valleys over) and is certainly the highest. Hi. I just returned from 2 weeks in Beaufort and like probably a few before have been inspired enough to want to aim for the Col du Pre. I am a 42 year old ex smoker who has £600 to spend on a bike so would love to know what specs i should be looking for (crank etc) it might not be pretty for the money but I’ll have a go at getting something as appropriate as I can. Thanks for the site, its spuring me on! Looking at the Trek 1.5 triple at the moment (2013), looks like it could be the one for the job in hand. It has a Shimano Tiagra 12-30, 10 speed cassette and some great reviews. Please intervene if you think I should stop now! !